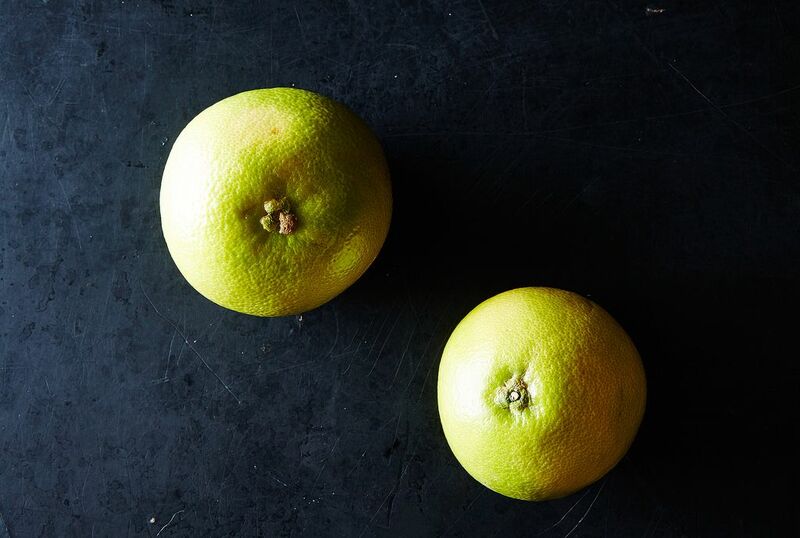 Today: The citrus fruit you've been missing out on. Citrus fruits are the bright spots of this time of year, our vibrant reminders that eating seasonally in the wintertime needn't be restricted to greens and storage crops. 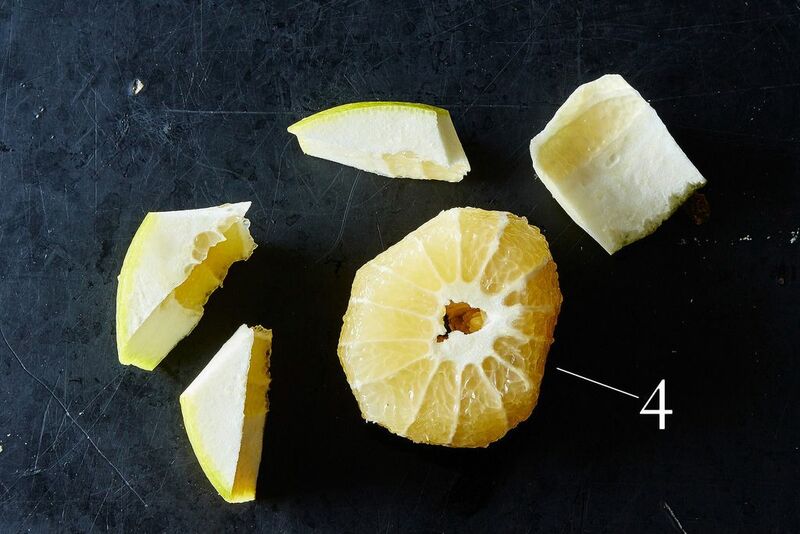 But if your citrus consumption has been limited to oranges, grapefruit, and Meyer lemons, you’ve been missing out. 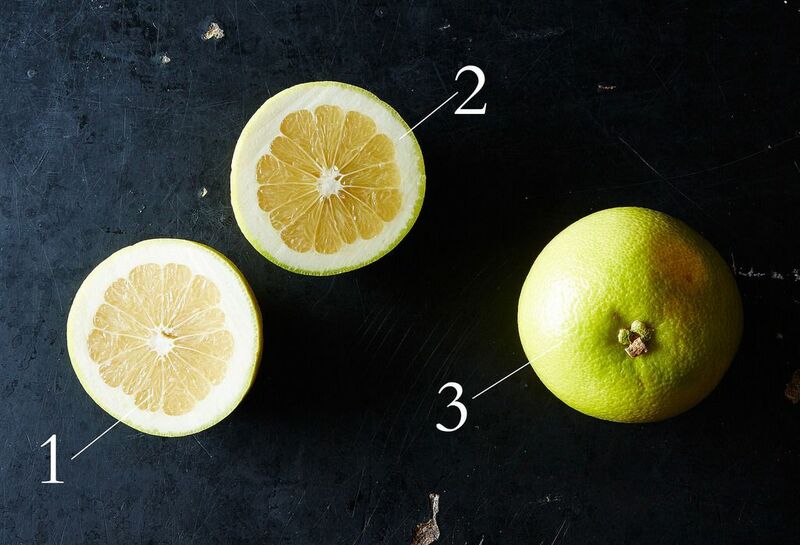 There are pomelos, finger limes, and perhaps the very best of all: oroblancos (which you may also see written as oro blanco or Oroblanco) -- a cross between a pomelo and a white grapefruit. More: And don't forget about blood oranges, either. If you remember anything from your high school Spanish class, you’ll likely be able to discern that its name translates to "white gold," and we're not the only ones who think its sweet golden flesh (1, pictured below) is more than deserving of its luxurious name and all of the superlatives you can throw at it. Marian Burros says she always knew that company was coming to dinner when she’d see her mother “carefully sectioning white grapefruit halves with a serrated knife, a bottle of maraschino cherries at the ready for topping,” but proclaimed: “If my mother had had Oroblancos, she would never have bothered with maraschino cherries.” This is because, as she says, the oroblanco "has a superb balance of acidity and sweetness." If oroblancos are so good -- and they are -- why are they sometimes hard to find? They aren’t as popular as they should be (yet) because they have a couple of traits working against them: One, they have a thick pith (2, above), and two, their skin is green (3, above) or yellow-green when ripe -- and we know green food can be a hard sell sometimes. More: Other types of produce have benefited from marketing campaigns, too, like sea beans and Jerusalem artichokes. Kim Boyce has turned oroblancos into sorbet -- you could also try using them to make a granita or ice cream. Add segments to a green salad or a fruit salad. Our friends at Frieda’s make a citrus salad with an oroblanco and oranges, and top it with a creamy lemongrass dressing. Those thick peels are meant to be candied. Use oroblancos in a marmalade or a mostarda. Use their juice in a homemade soda or a cocktail. I would argue against this unless you hit the oroblanco mother lode and have more than you know what to do with, but if that's the case, try using them in baked goods, too. Tell us: How do you like to use Oroblancos? They sell them at my Costco as "Sweetie" Jerusalem grapefruits. I bought them last week and they are a true cross between a pomelo & grapefruit. Downside is that like a pomelo they are 50% pith. I've tried peeling them like an orange but that's too time-consuming. We prefer eating them grapefruit-style but they;re quite small and sometimes you get a bit of bitterness from the pith. While they're sweet I think they're not that great in the end. Try cutting supremes. Level off each end, then pare off the skin and pith with a sharp knife, carving down from top to bottom. Then, with a paring knife, cut between each membrane and the sections will fall out. Has anyone been able to find these in the LA area? I haven't seen them but but I'll keep an eye out! Yes! At almost every farmers market in Los Angeles you can find Oro Blancos. To be honest I have never not seen them at a farmers market during the winter season. LJH -- you're killing me with the delicious citrus. I started up a batch of pomelocello after your post on pomelos. Now I want to start one with Oroblanco's too (I think a it would turn out a lovely spring green).